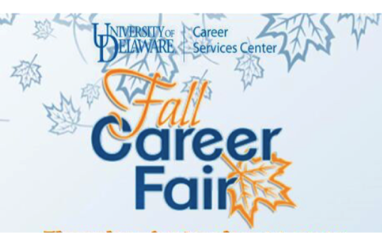 It’s been two weeks since the University of Delaware’s Fall Career Fair. By now you have probably dry-cleaned and put away your suit, filed those business cards somewhere safe, and lost half of the free stuff you grabbed after having incredible conversations with countless employers. So…now what do you do? Where do you stand? Whether or not the fair was a success, what can you do post-fair to further your professional journey? Write (yes, handwrite) thank you letters to all employers you spoke to at the fair. While it is important that you send follow up emails to recruiters at least 24 hours after the fair, you can make an even bigger impression by using- wait for it- snail mail. A handwritten letter helps you stand out in a sea of applicants as a candidate that truly valued the time recruiters took to speak with you, which is evident by the time you invested to write them an actual letter. By buying some blank cards and a few stamps, you are set to go above while also rediscovering the U.S. postal system at the same time. Revamp your professional brand. Prepare your personal materials to ensure you give off the best impression once you fill out those applications recruiters mentioned at the fair. If any employers gave you feedback on your resume, go through it to polish any missteps before offering it to anyone else again. If you have a LinkedIn profile, log on and add any relevant experience to showcase your work samples and highlight the accomplishments you can’t fit onto that one-page resume. Don’t have a LinkedIn? Make one- employers will be looking for it! Keep the conversation going. In today’s digital era, it is extremely easy to initiate and continue conversations with almost any employer. Thank the company for coming to the fair by mentioning them on social media. Send LinkedIn invitations to recruiters. In your follow up letters, indicate that you are interested in receiving more information about potential job opportunities and request an informational interview! Taking the initiative to reach out to these employers further indicates your determination and passion for whatever company you wish to work for. Check out Blue Hen Careers. Learning more about a company you found interesting at the fair is simple when you have access to a database of employers with website and contact information. Better yet, start browsing through the job search feature and see if any companies you liked posted applications specifically geared towards UD students. Then the ball is in your court- apply, apply, apply! The Fall Career fair may have happened two weeks ago, but there are many more weeks left to land the coveted job or internship in your field. The best and worst part about college is that opportunities do not just get handed to you; it is up to you and get out there and find them yourself. The Fall Career Fair pointed you towards the opportunities you’ve been looking for- now, it’s time to pursue them. Paxton is a junior at the University of Delaware majoring in Mass Communications with minors in Advertising, Entrepreneurial Studies, and English. When she’s not interning for the Career Services Center, Paxton can be found acting as the Vice President of External Affairs for PRSSA-UD, tweeting from her Social Media Ambassador account @BlueHenPaxton, volunteering with the sisters of Gamma Sigma Sigma, or running the H Factor Media. To learn more about Paxton, visit her website at www.paxtonmittleman.com or feel free to connect with her on LinkedIn. Previous: Previous post: #UDIntern: What Happens After Graduation?